We ate our first meal in Hong Kong at Sai Kung (西貢), a fishing harbor with the freshest selection of seafood you can find. 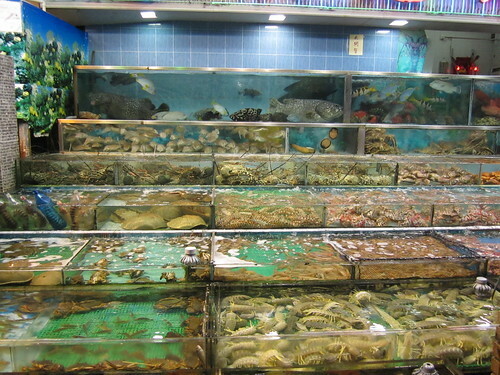 Sai Kung is basically an open market with huge exotic fish tanks displaying all the wonders of the sea. Its like a zoo for crustaceans. Once you pick your live selection of lobster, crabs, fish, clams, eels etc-- the vendor hands them over to the restaurant and they prepare your dish for you. My Cantonese vocabulary goes as far as "yao mo gao cho" (youve got to be kidding me), "diu leh" (f*ck you) and "ho tong ah" (it hurts)-- and the vendors English is next to none-- so we basically pointed and used broken Mandarin to communicate. 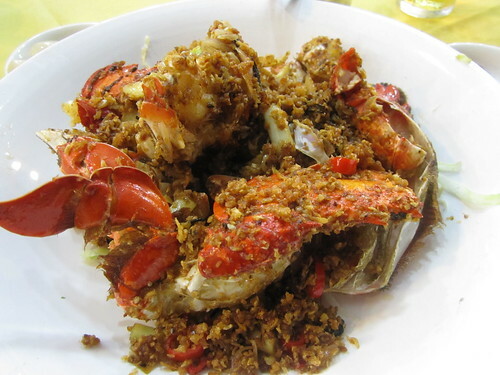 We had no idea what version of seafood we were actually eating-- if it was a Sri Lankan crab or Singaporean prawn. All we knew was that they were all alive and swimming before we ate them. And we were definitely indulging ourselves in our selection. The table next to us, 5 local men, shared 1 crab, 2 rice dishes and 1 vegetable dish. I can only imagine what they thought of us 3 American girls sharing 3 large selection of seafood, no rice, only Yanjing beer. (The bill was only $35 a person, so we remained well within our company stipend). 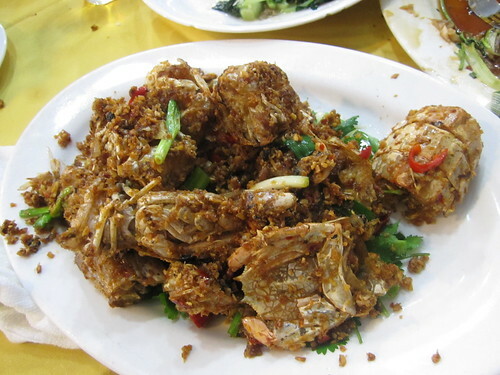 Our first dish (sorry theres no before pictures) was a huge crab. The best part is how they cooked it-- bi feng tang style. Its basically deep fried (so you can eat the shell too) and smothered with bread crumbs of panko, dried shallots, tons of garlic, and chili. 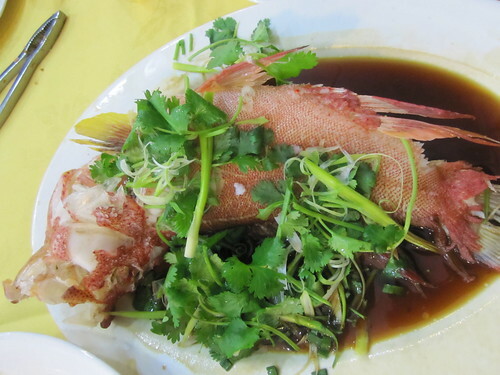 Our second dish was a whole fish, steamed with ginger, scallions, cilantro and soy sauce. Its a very clean version of cooking, complimenting the tender fresh meat of the fish. My mom would be proud of me for taking the liberty of eating the head, cheeks and eyes! And for our last dish we ordered the largest prawns Ive ever seen. The vendor actually just recommended us buying 2 and sharing it between ourselves-- but nope. We went all out and ordered one for each of us! The meat was sweet and juicy-- and of course, we cooked it bi feng tang style again. If you had to choose between going to Lei Yu Men (same set up, other side of HK) or Sai Kung-- its really a toss up. Its definitely cleaner, more condensed down, and very local in Sai Kung- but if you dont speak ANY Cantonese/ Mandarin at all, Id go for Lei Yu Men-- its more tourist friendly.